Plantatous: Halloween 2017 (it rhymes)! Cali: This is our first Halloween! I'm so excited! Karen: Yah . . . That's cool, but I think the fact that the comic anniversary is on the 28th of October is cooler. Ryan: The girls only let me have a tiny ax. They were worried that I might chop off my head if it was any bigger. Aaron: Don't worry dude. You can still hack off someone's head with that . . . If that's any consolation. Ryan: Well, uh well they can- oh! Oh. Aaron: This may be a problem. Ryan: How did you get that chocolate bar!? You're in a sleeping bag designed to look like a worm! You can't even move your arms or legs ! 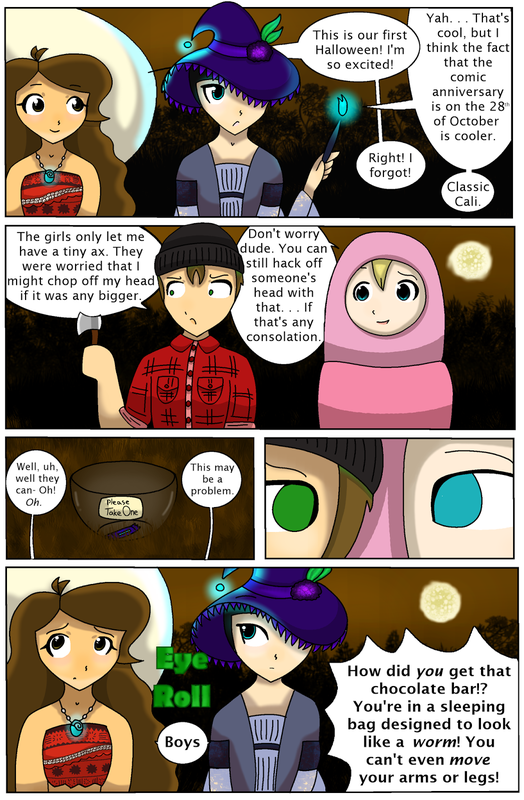 Halloween comic starring Plantatous! The Bronze Acorn takes Christmas if you're wondering. Not pictured: Brinen is a vampire.